On Sunday, September 1st, all major TV channels in Germany will broadcast the first (and only) “duel” between Angela Merkel and her challenger in the upcoming federal elections, Peer Steinbrück. As we have criticized in a previous post, both are not exactly known for their visionary positions on foreign policy. Nonetheless, we will make sure to watch the show. In particular, we’ll pay close attention to any mentions of foreign policy and international affairs. PS. For added fun, turn this into a drinking game! 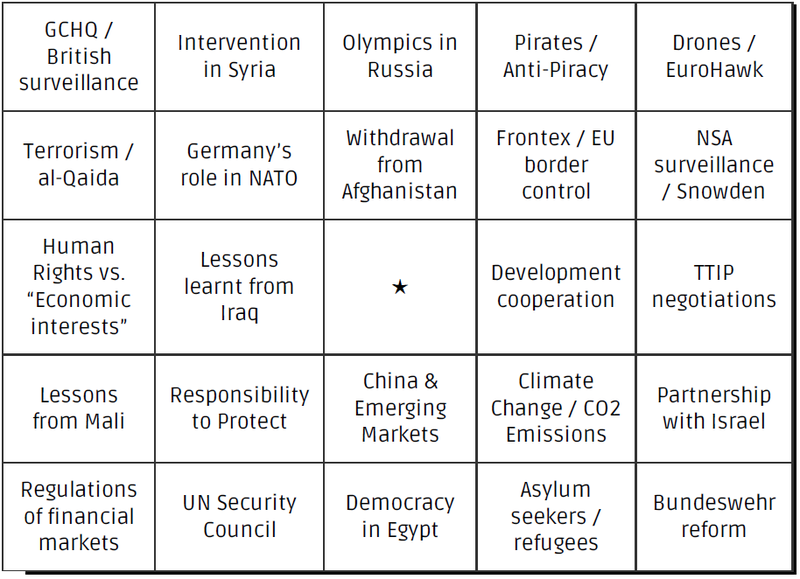 Take a shot for every topic that is mentioned, and prepare a bottle of champagne for the lucky winner (in case the candidates actually talk about foreign policy enough to fill a row on the card). To be honest, guys, I’d be happy if you could check 3 or 4 of these items. I’m afraid the only two foreign policy issues that will pop up in the debate will be the “Euro crisis” and “Syria”. On Syria, both will say that we need to find a “political solution”. As a friend of mine remarked, the essence of German security policy was on full display in an NZZ interview with Guido Westerwelle. Concerning a German role in the international response to the chemical weapons use in Syria, the foreign minister said that Germany hadn’t been asked to contribute to military action. Okay, then… If no one asks, why should we contemplate what to do? I couldn’t agree more. Foreign policy and security issues will not be the focus of interest on Sunday. After all, you will not win the elections based on your take on foreign policy issues. Any items that you would replace / add to increase the chance of winning the Bingo game? You’re right, you’re right. I’m just disappointed with the quality of the German foreign policy debate. 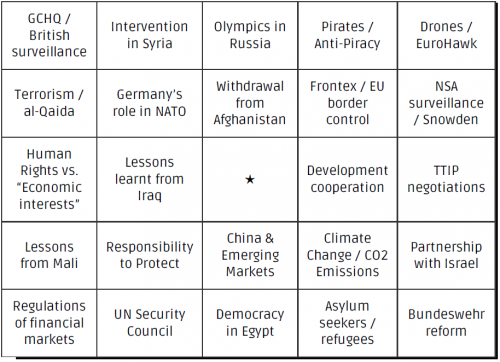 Ok, I just enjoyed the duel and even more so the German Foreign Policy Bingo on my porch in Williamsburg. No shots at hand, only iced tea. And I was really suprised that in the end I checked 10 items and almost managed a bingo (https://www.dropbox.com/s/qqwe2ja739539rk/2013-09-02%2015.00.02.jpg). Does anybody want to compare their scores? I admit that checking R2P was a IR-informed interpretation…but hey that is what we are for, isn’t it? Concerning topics you left out: Where was “Greece”? Or the EU in general? Steinbrück made it clear during his speech at Freie that he considers EU policy still to be foreign policy (www.osi-club.de/w/files/videos/osi-club_steinbrueck-rede_480x270.wmv), do you disagree?